Since 1988, the popular American wine publication Wine Spectator has unveiled their Top 100 list of the most exciting wines of the past twelve months. This year marks the 25th anniversary of the Top 100. Having reviewed 20,000 this year, the list came earlier this week with twelve countries represented (sorry Canada, none for you again). It has become very trendy to acquire the wines that made the grade. The average score on the wines on this list is 93 and the price per bottle this year being $51 (very high). Again this year, the list is American dominated.with no less than 37 wines from south of the boarder. Most people are surprised with #1 being a Spanish wine, alas I applaud that selection as Spain is a hotbed of great winemaking at reasonable prices. The availability of Top 100 wines this year is better than last year, we have eighteen wines for you to choose from. However, most are limited, so grab them sooner or later for some will run out well before Christmas. 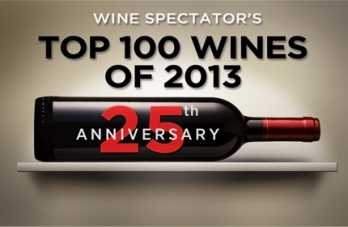 See the available Top 100 wines here.. Please also consider our annual Wine Spectator Top 100 tasting in early January – more info and registration here..
As is tradition, on the 3rd thursday of November, the world awaits in anticipation the arrival of Beaujolais Nouveau. deVine’s shipment has just arrived. 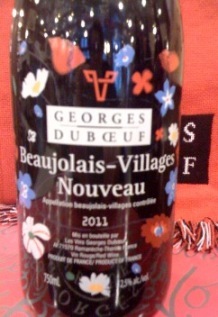 deVine will be receiving the 2013 Georges DuBoeuf Villages Beaujolais Nouveau – $22.99 this year. Enjoy this with a large group of friends or family, and serve it slightly chilled. Purchase your 2013 DuBeouf Beaujolais Nouveau online here..
It’s safe to say that Albertans are enjoying one of the best selections of craft beer in the country. Since the privatization of liquor in 1993 the ability to import brews from all over the world has become more simplified and has allowed for the incredible amount of variety that can be seen in retail liquor stores today. There are about 1500 different varieties available in the Alberta market, with craft beer making up around 2/3 of that selection, at least doubling what was available 10years ago. Brand loyalty for our domestic brands (Molson, Coors, Kokanee, etc.) still exists but has started to fade with the lure of something new and different. Why have we seen such a steady increase in craft beer consumption? My opinion is that in this era of information, a new generation of people are more open to and embracing the variety that life has to offer; in this case, fresh and innovative brews. After all, it is the third most consumed beverage in the world (water then tea being at the top of the list). So what does ‘craft’ beer mean? Essentially, a craft beer has been defined as an independently owned brewery using fresh, natural, and quality ingredients that are made in relatively small batches (between 1,800,000 and 600,000,000 L year), where more focus is on creativity and distinguishing flavors throughout the brewing process. In comparison, the mass producing corporate breweries (which pump out several billion L year) target a generalized array of tastes, keeping costs down by sometimes substituting corn or rice for malted barley, which will create alcohol but sacrifices flavor. They also pasteurize to cut costs, which increases shelf life, again sacrificing some of the flavor. Some big brewers hasten fermentation with enzymes that make a kind of beer concentration, which they will later add water to. None of the above happens when a craft beer is produced with the exception of pasteurization, which is uncommon, but does seldom happen. Now, this doesn’t mean that a big brewer doesn’t manufacture a decent beer; it’s just generally limited stylistically. Nor does it mean that a crafted brew will always be a better product (I’ve had some duds in my time), but the diverse range of brews that can be ‘crafted’ are abundant and there is something for everyone; from a Czech style pilsner to an Imperial IPA to barrel aged stouts. There seems to be no shortage of fresh, new products rolling into the province on a weekly basis and there’s no sign of it slowing down any time soon, which is fantastic…keep it coming! At deVine Wines our primary focus is on the wines we carry, but we’ve also always been passionate about the selection of beers that we stock – a majority portion of those being craft beer. I like to think that our selection of beer throughout the years has had some influence on how Edmontonians have diversified their taste for new and different brews, ultimately directing us towards the craft beer explosion we’re seeing today. When we first opened in 2005, we started with a stock of around a 100 or so different varieties and we’ve continuously grown our selection to the over 300 products on the shelves today. Not too bad for a little boutique store, eh? We are committed to keep continuously growing our selection, striving to provide a vast range of flavors and experiences for our customers. And keep your eye out in the future for upcoming beer related pouring’s, tastings and events. Stay Thirsty Edmonton! Hot on the heels of the equally great 2009 vintage, 2010 is yet another legendary year which will be highly sought out throughout its lifetime. While the 2009 are fruity, flamboyant and California like, the 2010s are in the classic, ageworthy style – the comparison between these two vintages will parallel the ongoing debate between 1989 and 1990. Our last Top Drops tasting of 2013 on Saturday, November 23 at 7pm will feature the Merlot dominant Right-bank wines from the famous and expensive appellations of St. Emilion and Pomerol. The growing season was near perfect in 2010, and the earlier ripening Merlot was in top shape for these two appellations. The other grapes, Cabernet Franc and tiny amounts of Cabernet Sauvignon also saw an ideal growing season. 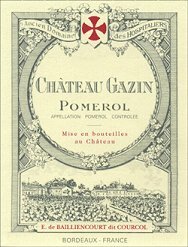 Pomerol saw tiny yields due to small grape size, thus the fabulous concentration, the 2010’s compares favourably to other historic vintages like 2009, 2005, and 1998 while St. Emilion in 2010 may be even more consistent as an appellation than 2009, it can be spoken in the same breath as the legendary 2005 and 1998’s. Speaking of 1998, perhaps a surprise wine from that vintage is in store for those who attend to sample some of the greatest Merlot based wines made anywhere in the world. Only 18 seats available for this event, so be sure to book early to avoid disappointment. Register online for the Top Drops: 2010 Right Bank Bordeaux tasting here..
For complete listing of all available 2010 Left Bank wines, click here..
For complete listing of all available 2010 Right Bank wines, click here..